LuAnn sat down with her daughter, Victoria, to have a talk about the birds and the bees. The teenager did her level best to explain to her Mom that having babies is an important decision, that anyone considering the idea should know if they’re willing assume the responsibility and if they’re even still able to have them. Lulu wants to try to have a baby with Jacques, because she thinks it would make him happy. I have a feeling that might not be the whole story, but I’ll let her have her little fantasy. We all want things we can’t have. For instance, I sometimes want to be the Mother of the Dragons, like the one from “Game of Thrones”. The little creatures are very cute and come in handy when their Mom gets into a bit of trouble. All I have to do is find some dragon eggs, warm them up and the fire-breathing babies will hatch. The odds of this actually happening are about the same as what LuAnn sees for her future. There are just some eggs that should simply be left undisturbed. Heather offered to help Sonja with her new business which has something to do with catering, toaster ovens and retro aprons. The Yummy Tummy queen is quite the hipster and likes to call phone people and call them names like baby-boo. She also likes saying “holla”. I’ll give her the benefit of the doubt. She did mention that she is still studying Judaism, so maybe what she’s really trying to say is “challah”, but hasn’t quite mastered it yet. She’s not ready to give her baby-boo Ramona a holla, though. It looks like she doesn’t want her competition in the interruption contest to go on the girl’s weekend to London. Since Aviva’s childhood injury, she has developed all sort of fears. She’s afraid of subways, because they’re enclosed and below ground. She doesn’t like planes or tall buildings because they’re above ground. She has a fear of giving her children permanent names. She’s afraid that women will steal her husband if he wears a wedding ring. The other ladies flipped that one on her, though. Now she’s developed a phobia that women will seduce him if he isn’t wearing a ring. She fixed that fear by buying a wedding band for him. Carole also held a face your fear of heights intervention for Aviva by inviting her and a couple of the other ladies for roof top cocktails. I’d say that the group therapy is working wonders for Aviva. A plane ride to England and some subway tokens and she may very well be on the road to recovery. Ramona, Mario and Carole met for lunch and Carole turned on every bit of minx that she had in her brilliantly funny arsenal. She flirted with Mario incessantly, not so much for Mario’s sake, but simply to see if Ramona could be struck speechless. It wasn’t a total success, but Ramona did do a little starting and sputtering. It was harmless, funny and fun. If they’re not careful, these women could actually become friends. Neither of them is a fool and one is the yin to the other’s yang when it comes to styles of honesty – they’re somewhat the same, in different ways. Together they could become a force of nature. 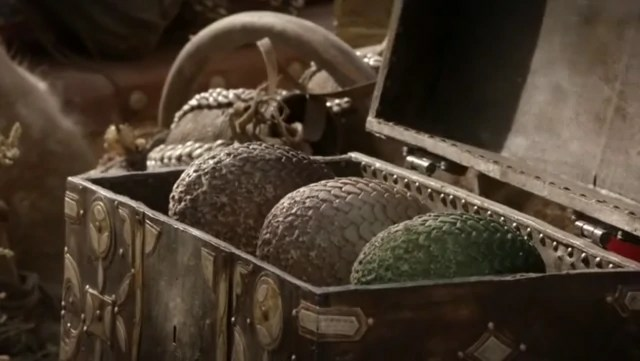 Before I forget, I found a picture of the kind of dragon eggs I’m looking for. I probably won’t use them, much as I’d like to have the winged ones around. If I do happen to come across the real ones, I’m sending them to LuAnn. In just the right setting, they’d make some lovely pieces of jewelry. Bonne chance, Countess. I’ve included Carole’s Bravo blog. It’s really the only one worth reading. Carole’s Bravo blogs …. I’m in lurv. Those are some mighty cute dragon eggs. You’re just the gal to be in charge of those little devils. Can you send them on dive bombing missions? Who do we apply to on your behalf? Good points. Speaking of … providing dental care would be a challenge. And the Tooth Fairy bills .. oh my! Empress, I think the dragons would be a great addition to Diva’s Island Nation and Empress pasture reserve. We could be like Costa Rica and have no standing army! LOL! PS: I really enjoy watching Game of Thrones, too! Hilarious recap. It wouldn’t be much of a show with just her but the one I’m enjoying the most is Carole. Between the show and her blog, well worth tuning in for. The rest, I can take or leave them and I kind of wish they would have just recast the entire franchise. “It wouldn’t be much of a show with just her but the one I’m enjoying the most is Carole.” Couldn’t agree more – Carole is the very witty Greek chorus to the others’ cacophony. Empress….there was an article in our local paper last week about Dandy Andys radio show… I think he is spreading his wings and getting into other projects and will be closing himself out of the whole HWS Series…I think all the cities have run their course and it’s time to put them al all out to pasture….The whole premise of these shows has changed what I would consider normal tv viewing HWS into nasty HWS.. what a shame…..
Hi Diva! I hope those NJ kids can learn what NOT to do from watching what their parents HAVE done….. Sometimes it does work out that way. I do agree, the HWS in general do set a very poor version of leading by example. So far I think I’ll be able to get into Longmire. I really liked Hell on Wheels, but it didn’t get picked up for a second season. Also looking forward to the return of Sons of Anarchy in September. I haven’t watched NY yet, so I’ll have to give you the jewelry update later……LOL! Dragon-egg jewelry, perfect and priceless! An enjoyable read here today, Empress, thanks. Hey Dame, I’m good; you? Looove Dragons! Have since I was a little girl many, many, years ago. RHONY is ok. At least it’s not headache inducing like RHNJ; I cannot not watch that one. Thanks Empress! Hi Dame! How are you? FLG! I heard you have been posting hither & yon. So good to see you! How are you doing? I’m better! Dame – I’m with you on the NJ gang! As for loving dragons, if I do happen a nest of eggs in the woods, I’ll set aside one for you – LuAnn will just have to look elsewhere for her accessories. I understand that JZ has 1,000s of eggs hidden somewhere. I’ve watched the episode now. LuAnn CSBHH’s lack of jewelry this episode was disappointing. The only jewelry I noticed was an obviously costume, overly beaded, overly stranded necklace in one of her talking head interviews. Because it was nested, it immediately drew my eye to her throat. I think she thinks it does the opposite. In a few more years she needs to rethink that. She would have been much better off with Empress’s dragon eggs. Perhaps earrings and a pendant. Even they are smaller than her usual hubcap sized pendants. When she was talking to her daughter, it struck me that Victoria was “mothering” her own mother. I guess the now unseen “mother’s helper” only advises the kids, not the Mom, unlike Rosie. Since the major cast change, for me, Carole continues to be the new “Breakout Star” of RHONY. Other than her books, she seems concentrated on promoting the work of her comrades. I adore someone who seizes the opportunity to promote their friends. I don’t think she will be jealous if they become successful. I like “bohemian” coming back into fashion and always gravitated toward “hippy chicks” as well as ladies. Their intelligence (at least those I’ve known), free spirited and independent approach to life makes them fun. FLG, It’s good to know that you also see a way in which LuAnn could repurpose those eggs. Much as I would hate to give them up, I think they’re going to a good cause. No, Carole does not strike me as the type to be jealous or worry about designer labels – a marked difference from all of the HWs we’ve seen, in any of the cities. Nice uni in your avatar DD. Who knew you could order a six pack of abs and a metal “cup” at the Burger Barn? I’ll bet no one left a mess at their table during YOURshift! Note to self … upgrade khakis.